Whether you’re a first-time exhibitor or an expo veteran, you’ll need an exhibition stand to wow the crowds and attract people to your stand. 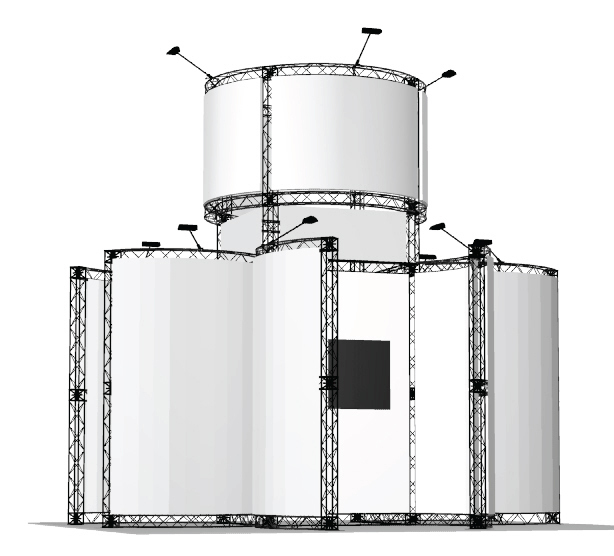 Both truss and pop-up stands have their advantages, but what kind of stand is best for you and what actually are these stands? Here’s our beginner’s guide to portable pop-up stands and truss stands to help you decide which is right for you. Truss stands provide a professional and eye-catching solution for any exhibition. You may know this type of stand as a gantry stand, these are modular stands usually made from plastics or metal. The rigid structure creates a temporary framework which can be altered and changed depending on your space and the purpose of the event. Creating a visual impact at an exhibition is an important part of having exhibition success. A truss stand not only achieves this but it also reusable. So, what are the benefits to using a truss stand? Versatility – Truss stands are designed to be modular, this means that you can rearrange the layout of this stand, whether you want a huge tower or a really small stand. Truss stands provide the versatility you need to use them in any space. Return on investment – Truss stands can be used again and again, with no problems. Due to the versatility and the strength of this stand, it can be repeatedly used in a whole range of different spaces. The truss stand really does provide you with the tools that you need to create your perfect vision and attract visitors to your next stand. If you want more information about our range of truss stands, visit our page for more information. Pop-up stands are portable and lightweight exhibition stands, usually made from a plastic frame covered in fabric. These stands are great if you’re travelling between exhibitions with very minimal space. However, they are not the most durable of stands and need replacing far more frequently than a modular truss stand would. The fabric stands can be printed with your branding and the information that is unique to your company, however, because of the nature of these stands, you may blend right in with other exhibitors. These stands are extremely popular with exhibitors, but you pay the price for this by not having a unique or particularly eye-catching stand. But, what are the benefits to having one of these quick, pop-up stands? Easy setup and take down – Pop-up stands simply fold and unfold – they are readily assembled as soon as they’re removed from their containers. Easily transportable – The nature of these stands means that they are able to fit into small spaces and are stored in a fairly small bag, this means that transporting them from show to show will be no problem. You could even take them on public transport easily! Low cost – For some, the disadvantages in the durability of this stand will be made up for with the low price. It has an extremely low initial cost and compared to more professional, durable stands there can be a big difference. So which stand is best for you? Deciding which stand is right for your business may be the easiest decision you’ve made all day (we know that we pick durability and professionalism over cost any day), or it could be a bit of a hard decision. One of the keys to having a successful exhibition is standing out from the crowd, catching visitors eyes and overall looking interesting and engaging. Are you going to be able to do this if your stand is the same as 100 others in the room? Probably not, but will you do this if you have a large tower and stand that fills your space? Well, that one is up to you. Both of these stands are completely portable, with the truss stands packing down into a few large bags and the portable stand fitting exactly back into its case. If it’s down to transporting the stand there is very little in it, maybe just the size of your car. The banner and decoration capabilities of truss stands allows for a high rate of interchangeability and it is easy to change said decoration, making this an extremely cost-effective method of promoting your stand and your business. Whereas, with the pop-up stands you are tied into your original banner design. If you want to know more information about exhibition stands, why not have a look at our favourites here.